The November Systems Index saw IBM and Intel, once again, top the Analyst Index. They hold first and second place respectively. AMD moved up to eighth position and managed to dislodge Toshiba back to tenth. Despite, or more likely perhaps because of, its on-going EU dispute Qualcomm has had an impressive month climbing five spots to number 28 in the rankings. Indeed, its saga continued yesterday when it was announced that the Japan Fair Trade Commission (JFTC) may investigate Qualcomm ‘s licensing and chip business practices in Japan. Texas Instruments had a good month. It rose three places as did Symbol: both have entered the top 25. 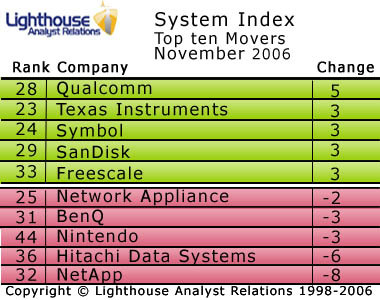 SanDisk and Freescale are also notable for their steady improvement on last month’s showing. On the downside, NetApp has fallen out of the top 25 altogether which is surprising given its sterling performance in the media last month, but is pretty much in line with the stock market over the same period. Even so, this still represents a net gain of 3 positions over 2 months, also reflecting the rise of Network Appliance’s stock in September. Hitachi Data Systems has also fallen this month, by 6 places. If you wish to be sent the top 25 firms in Systems Index each month, email us at analysts at lighthousear dot com. You can also read how we do our Analyst Index rankings.